In robotics, it is often practically and theoretically convenient to design motion planners for approximate low-order (e.g., position- or velocity-controlled) robot models first, and then adapt such reference planners to more accurate high-order (e.g., force/torque-controlled) robot models. In this paper, we introduce a novel provably correct approach to extend the applicability of low-order feedback motion planners to high-order robot models, while retaining stability and collision avoidance properties, as well as enforcing additional constraints that are specific to the high-order models. 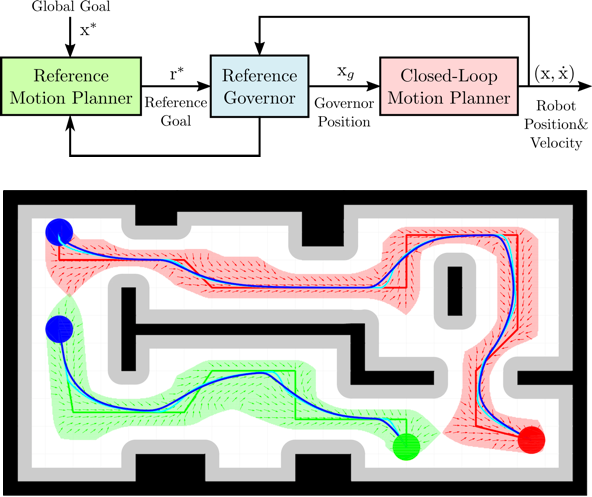 Our smooth extension framework leverages the idea of reference governors to separate the issues of stability and constraint satisfaction, affording a bidirectionally coupled robot-governor system where the robot ensures stability with respect to the governor and the governor enforces state (e.g., collision avoidance) and control (e.g., actuator limits) constraints. We demonstrate example applications of our framework for augmenting path planners and vector field planners to the second-order robot dynamics. This work was supported in part by AFRL grant FA865015D1845 (subcontract 669737–1).